Growing old has a lot of pluses: Gaining wisdom, getting to travel more, retirement, and just getting to a time of your life when you have a little more time to explore your interests. But aging also has some downsides, physically speaking -- and a lot of them have to do with your skin. Crows’ feet, wrinkles, loss of skin elasticity, age spots and other signs of aging begin to show up, and you might wonder what you can do about it. Skincare compounding can provide options for the treatment of aging skin and can be compounding specifically for your skin type. Wrinkling and elasticity loss can be caused by several environmental and lifestyle factors, such as smoking, stress, sun damage, poor nutrition, and fatigue. The skin care and cosmetic products you have used for years also play a part in the condition of your skin: Harsh skin cleansers, makeup and detergents can cause your skin to age much faster than you’d like. Although you can’t undo years of damage, your compounding pharmacist can work with your dermatologist to compound prescription anti-aging skincare products according to your skin type and needs. These specially formulated products are called “cosmeceuticals,” meaning cosmetics that have been formulated to have medicinal or anti-aging properties. 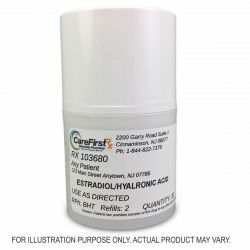 Our Estradiol/Hyaluronic Topical Cream can be compounded with a special cream to help with anti aging effects. Please call us or submit a request for more information. Glutathione is an endogenous antioxidant. Hydroquinone is used for hyperpigmentation, melasma, dark spots and freckles. Tretinoin is a medication used to treat acne vulgaris. It promotes the exfoliation of affected skin areas and unclogs pores. Tretinoin controls skin break out yet does not cure it.